Many New Mexico residents find it shocking to learn that their state ranks sixth highest in the nation with respect to identity theft, with nearly 2,000 people reporting such crime in an average 12-month period. While that may not seem like many, it represents a rate of 98 cases for every 100,000 people in the state population (in the state with the lowest numbers, South Dakota, that rate is only 29.1 out of every 100,000 residents). Because identity theft is on the rise, it is recommended that people in New Mexico take steps to prevent this intrusive crime from happening to them. One such strategy that many choose is to use Identity Theft Protection services. These companies keep clients' personal information - birth dates, addresses, social security numbers, and credit and bank account numbers - on 24-hour monitoring systems, so that any unauthorized use of their information is detected almost instantly, preventing the criminals from doing any further damage to their victims. Because identity theft can go unnoticed for long periods of time, these services offer significant peace of mind to customers with their constant protection of their credit and reputation. 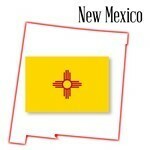 Another important step for New Mexico residents is to be careful with devices and online activities. Laptops, smartphones, and other electronics should be password-protected, making it difficult for thieves to access any sensitive information that may be stored there. When using public Wi-Fi, any information sent may not be safe unless the wireless network itself is secure. Also, when choosing passwords both for devices and online accounts, it is recommended that users not use anything that is easy to guess (e.g. words found in a dictionary or names of family members) but rather a combination of letters and numbers that are simple for users to remember. With the help of Identity Theft Protection services and common-sense safety measures online, most people in New Mexico will never experience the intrusive crime of identity theft.